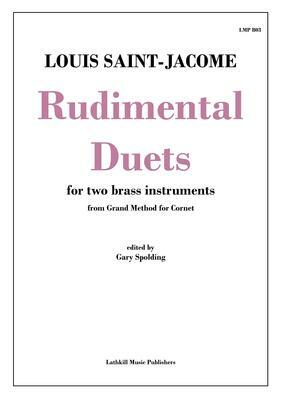 Rudimental Duets by Louis Saint-Jacome comprises ‘Scales in the Keys most used on the Cornet (with accompaniment)’ and ‘Intervals of the Key of C or Natural Scale’ on pages 88 to 101 of the Grand Method for Cornet. They are not the most earth-shatteringly brilliant duets ever conceived for two brass instruments but they are charming to play and especially useful material for teachers to play along with students. Available in treble or bass clef and free to download. Just click above. any treble clef Bb instrument with any concert pitch bass clef instrument (e.g., trumpet & trombone). It doesn’t matter if the instruments are pitched an octave apart or if the lower-voiced instrument plays the upper stave.